In an ideal world, the shared goal of performers and theater-creators is to transfix and captivate an audience, and leave them with a different outlook than when they arrived. If the toddler sitting next to me—completely still, eyes fixed on the stage for a full fifty minutes—was any indication, Addy & Uno, currently running at the Kirk Theatre, does just that. Brought to life with puppetry and music, Addy & Uno manages to say a great deal in under an hour about friendship, kindness, and the varied meanings of “different” and “special”. 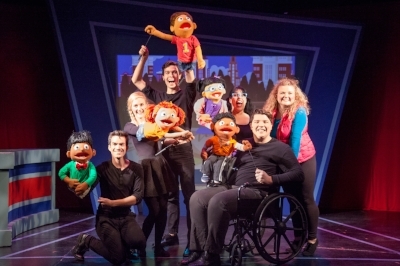 The puppetry is similar in technique to the method used in Avenue Q, but the puppets here represent children with vision and hearing impairment, wheelchair use, autism and ADHD. The show depicts these challenges not as limitations but as an impetus for exploration of what makes each character unique and exceptional. The plot: Addy (Caitlin Donohue), who has ADHD, signs up her friend Uno (Noah Pyzik) for a math competition in order to win a new red bicycle. Uno loves math and is extremely good at it, but his autism makes him shy around big groups and the public speaking the competition requires makes him nervous. His friends help him find the courage to join the math team and take part in the competition. Uno and Addy’s friends all have things that make them different and they all have to deal with the school’s bullies, but in focusing on what each of them is good at, they build each other up through kindness, empathy and respect. To anyone sitting in the audience of Addy & Uno, Somaza’s words have the ring of truth. The show’s impact is apparent simply by looking at the faces of the families. The audience is included throughout the story. Addy and Uno ask for advice and the children heartily chime in with encouragement; they learn how to sign, they even dance along to the music. Their open-minded curiosity and engagement is infectious: it’s obvious that they see themselves in the characters and quickly come to view them as friends. This is evident at the meet-and-greet the cast hosts after every show, when the children have the chance to interact with the actors and see the puppets up close. At the meet-and-greet I attended, I heard the story of a hearing-impaired child who eagerly waited to meet “Seemore,” the puppet who is also hearing-impaired. Unfortunately, the actor who plays Seemore (Stephen Velasquez, in the performance I saw) had to leave right after that particular performance. Tom went backstage and brought the puppet out, and the child immediately leapt up and gave him a big hug. The show feels especially important considering the current social and political climate. “This world is so polarized right now and everybody's differences are highlighted, usually in a negative way,” Donohue says. “So this show really does the opposite of that. It says, look, here are these differences and it really showcases them, but it shows why they might be more amazing and more special then maybe at first glance.” Addy & Uno emphasizes celebrating differences while also focusing on what people have in common: Uno and Greg (one of the school’s bullies, played by Bryan George Rowell) both love math. Cindy, another bully, loves rockets, just like RJ. At the center of the show is an anti-bulling message. “I feel like just being a more open human, just being willing to share your heart with people,” Rowell says. “I think that it's a scary thing for a lot of kids. And the show is all about owning who you are and also accepting everybody else. I think if people were more aware of everyone else they would become more accepting and compassionate.” The actors hope the legacy of the show will be to inspire children to befriend someone to whom they otherwise wouldn’t have reached out. As for the show’s future, everyone involved is intent that the production continue to reach as many people as possible. “We would love for all kids to be able to see the show and feel represented,” Pyzik says, “so whatever form it takes, … a tour, if it’s that different schools own the production, whatever reaches the most children and can change the most lives and touch as many families as possible. We want to make it accessible to everybody.” The show has launched a GoFundMe campaign with a goal of $75,000. Part of the purpose of the fundraising is to halve the cost of tickets, making the show to be accessible to people at any income level. I came out of Addy & Uno We with a fresh realization that we are living in a time where compassion and empathy are especially vital. Perhaps theatre for all age levels should be reminding us to give everyone the opportunity to feel accepted and loved exactly the way they are. “The show is important because we’ve never seen a musical geared towards children that highlights all these different kids with different abilities, and highlights what makes them special and unique,” says Brent Jones. “I think now it is important that children see themselves in a positive light and not a negative light, especially in the media.” Addy & Uno reminds both children and adults that kindness, above all else, makes all the difference. Addy & Uno runs Saturdays at noon at The Kirk Theatre on Theatre Row. Directed by Donna Drake. Music and Lyrics by Bonnie Gleicher. Based on a concept and book by Nava R. Silton, Ph.D. With Kate Ryan, Amanda Lopez and Derek Murphy. Tickets and information available at AddyandUno.com.